For a while, let us put aside the progress in economy and market, there are some serious concerns towards religious aspects that must be taken care of. What all happening now in every corner of the world is simply intolerable. Numerous hate crime scenes, brutal blasts and bullying issues, though many religions are cornered by the majoritarian, Islam is somehow the possible victim in all the situations, now, when the story is about Europian countries, then there’s no doubt in that. But, these days, there has been a significant rise in anti-Muslim hate crimes in Britain. Recent reports from Press TV, London’s Metropolitan police recorded more than 1,200 incidents of Islamophobic hate crime were registered till March 2017, which is 12 months. 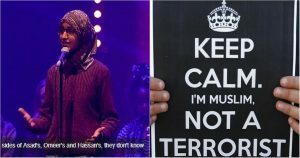 In an effort to raise the awareness, London University’s student Suhaiymah Manzoor-Khan addressed her opinions through a brilliant speech poem titled ‘This Is Not A Humanising Poem’. This video of her is uploaded on Facebook by Roundhouse and is now going viral, garnering 12K plus likes and 1.75+ Million views.